For most of the last four centuries, the broad expanse of territory between the Baltic and the Black Seas, known since the Enlightenment as "Eastern Europe," has been home to the world's largest Jewish population. The Jews of Poland, Russia, Lithuania, Galicia, Romania, and Ukraine were prodigious generators of modern Jewish culture. Their volatile blend of religious traditionalism and precocious quests for collective self-emancipation lies at the heart of Culture Front. 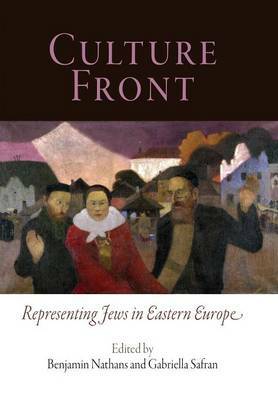 This volume brings together contributions by both historians and literary scholars to take readers on a journey across the cultural history of East European Jewry from the mid-seventeenth century to the present. The articles collected here explore how Jews and their Slavic neighbors produced and consumed imaginative representations of Jewish life in chronicles, plays, novels, poetry, memoirs, museums, and more. The book puts culture at the forefront of analysis, treating verbal artistry itself as a kind of frontier through which Jews and Slavs imagined, experienced, and negotiated with themselves and each other. The four sections investigate the distinctive themes of that frontier: violence and civility; popular culture; politics and aesthetics; and memory. The result is a fresh exploration of ideas and movements that helped change the landscape of modern Jewish history.